My life is full of little people and this past year I had two preschoolers and a toddler tagging along. I can never have too much encouragement or too many ideas as I teach my littles. 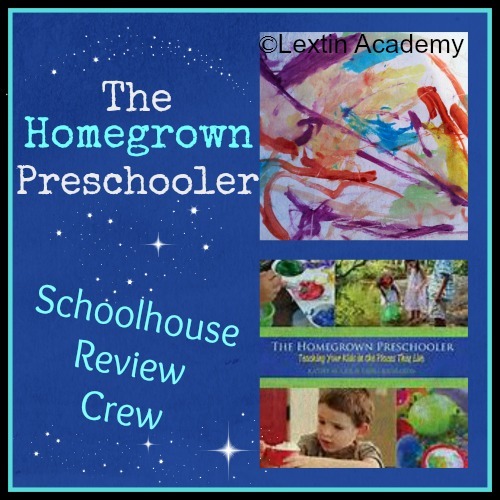 Therefore, I was thrilled to review a resource for parents or teachers of preschoolers: The Homegrown Preschooler from Gryphon House! Gryphon House is a publisher of resources for early childhood education. The company originally began as a distributor of quality teacher books and then expanded into distributing teaching resources as well. Gryphon House now publishes numerous books for children, parents, and educators. They publish authors such as Pam Schiller and MaryAnn F. Kohl. The Homegrown Preschooler is a book to inspire parents to turn their home into a rich learning environment for their preschooler. The two authors are both homeschool moms who, even with their different approaches to education, feel the home can be the best learning environment for preschoolers. They encourage parents to teach through everyday occurrences and through play time. The authors share their experiences in educating their children as well as the ideas that they have developed and used in their own homes. The first half of the book has advice for how to create a home learning environment and how to teach through play time. The book provides examples of how each subject can be taught through playful learning. There are also tips for organizing your supplies, how to best prepare your space for learning, setting learning goals for your preschooler, and teaching on the “off” days or under special circumstances, such as a child with learning disabilities or dealing with a chronic illness. The book is also filled with pictures of many of the projects and ideas. Sprinkled throughout many of the pages are recipes and additional teaching tips. The back of the book has a helpful glossary for a quick reference to the activities found throughout the book. This book is for parents of preschool-aged children but has ideas that can be used with children who are toddlers or early elementary. The book retails for $29.95. I read through the first portion of the book and gleaned new ideas and inspiration for teaching. Then I paged through the second half of the book and found some fun ideas for my kids. Next, it was time for the fun part! Trying out some of the ideas and putting my new knowledge to good use. My kids loved making a huge tent on the side of our stairs. Then we had some imaginative play and turned our tent into a candy store. The kids made pretend candy out of clay and colored pom-poms and they sold candy to me (it was rather expensive!). We painted with colored shaving cream and made a foamy mess on our art table. And Daddy was so sweet to make us a light table for the kids to explore. They have loved the colored shapes that they can use to build or to explore color mixing as they overlap the colors. In using this book, we have built with blocks, explored different art mediums, pretended, imagined, and made messes together. It has been such a fun time of memories and learning! This is an amazing resource! I only wish it came with a maid for after we have an wonderful time painting with shaving cream or when we’re done playing with bubbles. The process of learning is messy! I’m still trying to accept that…. You might have to take some shopping trips to track down items for some of the activities. And the book did have instructions for building your own light table or plexi glass easel. However, we did not have the tools to do so. Miter saw???? So we built ours with a plastic tote and some rope lights. We kept things simple! The best part of the book – the beautiful pictures! They are so inspiring and encouraging. I found so many ideas from looking at their set ups, their art ideas, and the many tools and supplies the authors used with their own children. Many times I just sat and paged through the pictures to find some new ideas to try. The authors share their personal experiences with you in an open and honest way. It really helped me to read about their homeschool journey and learn from their mistakes and their successes. I love reading books and resources in which the authors don’t pretend to be perfect and when they openly acknowledge the difficulties that come with parenting and teaching young children. The ideas for organizing your learning space and creating inviting learning centers gave me some wonderful ideas. And these ideas were actually doable – unlike the overachieving Pinterest-inspired ideas! The book has recipes that are gluten free! Do you know how rare that is? We are on special diets at our house (due to food allergies) and we can have many of the recipes! Yes! I love the variety of ideas and how they are divided by the subject area that they teach and reinforce. It’s so easy to flip through each section and find specific activities. And you’ll have ideas to last you for a long time! This is an excellent resource for any parent or educator of preschoolers. It’s going to be my go-to book for ideas and I’ll refer to the beautiful pictures for inspiration often. I have loved reading through the first section and have used the last half of the book as a reference for ideas and activities. I highly recommend this resource! Read other reviews from the Review Crew!